With the Super Bowl just around the corner, playoff season is in full swing (er, pass)! Cheering on your favorite team can really make you work up an appetite. Here are some great burgers, snacks and bites to get your tastebuds in the spirit. Perfect eats for Sunday football. Many sports fans fess up to enjoying football food more than the game. Problem is, typical fan fare like chips and dip, burgers and brats, pizza, wings and beer can easily add up to more than a day's worth of calories and several days' worth of saturated fat -- all before kick-off! Here are some of my favorite lighter football snacks so you don't end up feeling like a 300-pound lineman by the end of the season. The winner filled our hearts with happiness, and the loser filled our hearts with rage. Sorry, we thought we heard you say "quinoa salad." Think of these recipes as a winning touchdown. Yes, you read that correctly. Let's do this. Sometimes the easiest thing is the best thing. Ditch the concession stand and make these at home instead. Psst: one of them involves mac and cheese. Which snacks scored a touchdown and which ones were sacked? 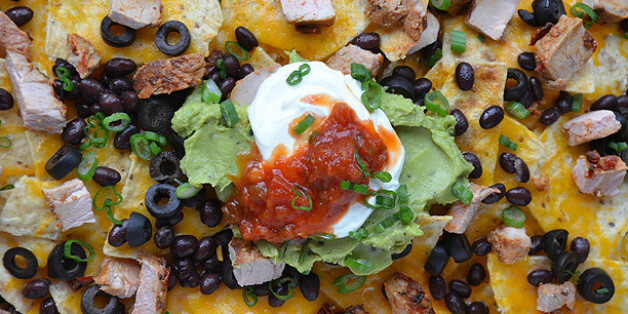 Tater tots + nachos = football snack heaven. Mix and match your way to a winning game-day snack strategy with 10 takes on chips, cheese, and toppings.